Built on a three kilometre long stretch of sand dunes on the beautiful Costa Verde, this is one of the Portuguese golf links that secured a high reputation for Itself when it when it was selected to host two events in the European Professionals' Circuit. This is one of the oldest courses in the country. Its nine holes, some of whose tees are situated on top of sand dunes, are almost all framed by ocean views. Oporto G.C. is an authentic links established in 1890, and is one of the oldest golf courses in Continental Europe. This makes it a club proud of its hallowed traditions. Located near the towns of Amarante and Marco de Canavese, it is a beautiful winding course with several waterfalls ina asetting that is typical of Northern Portugal. 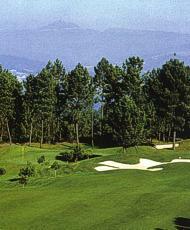 The nine hole Vidago course was inaugurated in 1936 and forms part of the beautiful Parque das Termas de Vidago.